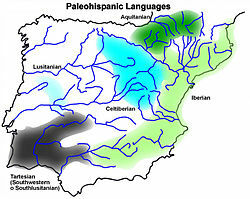 Paleohispanic languages according to inscriptions (except Aquitanian - according to anthroponyms and theonyms used in Latin inscriptions). A northeastern Iberian signary (not dual). The Paleohispanic scripts are the writing systems created in the Iberian peninsula before the Latin alphabet became the dominant script. Most of them are unusual in that they are semi-syllabic rather than purely alphabetic, despite having supposedly developed, in part, from the Phoenician alphabet. Paleohispanic scripts are known to have been used from the 5th century BCE — possibly from the 7th century, in the opinion of some researchers — until the end of the 1st century BCE or the beginning of the 1st century CE, and were the main scripts used to write the Paleohispanic languages. Some researchers conclude that their origin may lie solely with the Phoenician alphabet, while others believe the Greek alphabet may have had also a role. The Paleoiberian scripts are classified into three major groups: southern, northern, and Greco-Iberian, with differences both in the shapes of the glyphs and in their values. the Southeastern Iberian script, also known as Meridional. The Greco-Iberian alphabet was a direct adaptation of the Ionic variety of the Greek alphabet, and only found in a small region on the Mediterranean coast in the modern provinces of Alicante and Murcia. Excepting the Greco-Iberian alphabet, and to a lesser extent the Tartessian (southwestern) script, Paleoiberian scripts shared a distinctive typology: They behaved as a syllabary for the plosives and as an alphabet for the rest of consonants. This unique writing system has been called a semi-syllabary. In the syllabic portions of the scripts, each plosive sign stood for a different combination of consonant and vowel, so that the written form of ga displayed no resemblance to ge, and bi looked quite different from bo. In addition, the original format did not distinguish voiced from unvoiced plosives, so that ga stood for both /ga/ and /ka/, and da stood for both /da/ and /ta/. On the other hand, the continuants (fricative sounds like /s/ and sonorants like /l/, /m/, trills, and vowels) were written with simple alphabetic letters, as in Phoenician and Greek. Over the past few decades, many researchers have come to believe that one variant of the northeastern Iberian script, the older one according to the archaeological contexts, distinguished voicing in the plosives by adding a stroke to the glyphs for the alveolar (/d/~/t/) and velar (/g/~/k/) syllables, creating distinct glyphs for unvoiced /t/ and /k/, and restricting the original glyphs to voiced /d/ and /g/. (This is the so-called dual signary model: see northeastern Iberian script.) If correct, this innovation would parallel the creation of the Latin letter G by the addition of a stroke to C, which had previously stood for both /k/ and /g/. The Tartessian script is typologically intermediate between a pure alphabet and the Paleohispanic semi-syllabaries. Although the letter used to write a plosive was determined by the following vowel, as in a semi-syllabary, the following vowel was also written, as in an alphabet. (See Tartessian language for an example.) This redundant typology re-emerged in a few late (2nd and 1st century BCE) texts of northeastern Iberian and Celtiberian scripts, where vowels were once again written after plosives. Some scholars treat Tartessian as a redundant semi-syllabary, with essentially syllabic glyphs followed by the letter for the corresponding vowel; others treat it as a redundant alphabet, with the choice of an essentially consonantal character decided by the following vowel. The paleoiberian semi-syllabaries clearly derive ultimately from an alphabet or alphabets circulating in the Mediterranean, but it is not known whether that was the Phoenician alphabet alone, or if archaic varieties of the Greek alphabet also played a role. The only known full Paleoiberian signary, on the undated Espanca tablet (not completely readable, but clearly related to the southwestern and southeastern scripts), follows the Phoenician/Greek order for the first 13 of its 27 letters: Α Β Γ Δ Ι Κ Λ Μ Ν Ξ Π? ϻ Τ. 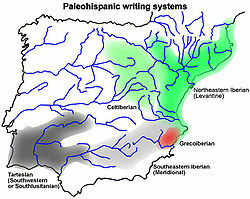 The fact that southern paleohispanic /e/ appears to derive from the Phoenician letter ‘ayin, which gave rise to Greek Ο, while southern iberian /o/ derives from another letter or was perhaps invented, suggests that the development of vowels in paleoiberian semi-syllabaries was independent of the Greek innovation. However, the order of what appears to be /u/ directly after Τ, rather than at the place of Ϝ, has suggested to some researchers a Greek influence. (In addition, the letter for /e/ in northeast Iberian resembles Greek Ε rather than the southeast Iberian letter.) The two sibilants, S and S', are attested, but there is one sign too few to account for a full 15-sign syllabary and all four of the letters M, M', R, and R' (not all of which can be positively identified with letters from the tablet), suggesting that one of ems or ars shown in the charts to the right is only a graphic variant. The obvious question about the origin and evolution of these scripts is how a purely alphabetic script was changed into, or perhaps unconsciously reinterpreted as, a partial syllabary. It may be instructive to consider an unrelated development in the evolution of the Etruscan alphabet from Greek: Greek had three letters, Γ, Κ, and Ϙ, whose sounds were not distinguished in Etruscan. Nonetheless, all three were borrowed, becoming the letters C, K, and Q. All were pronounced /k/, but they were restricted to appear before different vowels — CE, CI, KA, and QU, respectively, — so that the consonants carried almost as much weight in distinguishing these syllables as the vowels did. (This may have been an attempt to overtly indicate the vowel-dependent allophony of Etruscan /k/ with the extra Greek letters that were available.) When the Etruscan alphabet was later adapted to Latin, the letter C stood for both /k/ and /g/, as Etruscan had had no /g/ sound to maintain the original sound value of Greek Г. (Later a stroke was added to C, creating the new Latin letter G.). Something similar may have happened during the evolution of the Paleoiberian scripts. If writing passed from the Phoenicians through the Tartessians, and the Tartessian language did not have a /g/ or a /d/, that would explain the absence of a distinction between /g/ and /k/, /d/ and /t/ in the southeastern Iberian and later northeast Iberian scripts, despite it being clear that these were distinct sounds in the Iberian language, as is clearly attested in the Greco-Iberian alphabet and later use of the Latin alphabet. In Tartessian script, vowels were always written after the plosives, but they were redundant — or at nearly so — and thus it seems they were dropped when the script passed to the Iberians. Among the velar consonants, ka/ga of southeastern Iberian and the southwestern script derives from Phoenician/Greek Γ, ke/ge from Κ, and ki/gi from Ϙ, while ko/go (perhaps coincidentally) resembles Greek Χ (pronounced [kʰ]). Phoenician/Greek labial letter Β was the source of southwestern be, southeastern ba; the use of Π is uncertain but may have been the source of bi. (If Greek was used as a secondary source, Greek Φ ([pʰ]) would also have been available.) For the alveolars, Δ was the source of tu/du, Τ of ta/da, and Θ of ti/di. Tartessian or Southwest script. Fonte Velha (Bensafrim, Lagos). Southeastern Iberian script. Lead plaque from La Bastida de les Alcuses (Moixent). Greco-Iberian alphabet. Lead plaque from la Serreta (Alcoi). Northeastern Iberian script. Lead plaque from Ullastret. Celtiberian script. Luzaga plaque (Guadalajara, Spain). Correa, José Antonio (2004): «Los semisilabarios ibéricos: algunas cuestiones», ELEA 4, pp. 75–98. Ferrer i Jané, Joan (2005) Novetats sobre el sistema dual de diferenciació gràfica de les oclusives sordes i sonores, Palaeohispanica 5, pp. 957-982. This page was last edited on 26 March 2019, at 01:07 (UTC).